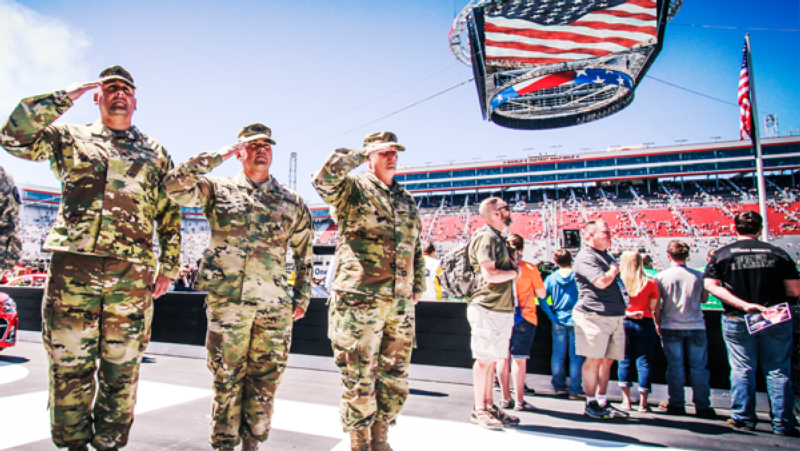 There's a true sense of patriotism that fills the air for the thousands of fans in attendance at Bristol Motor Speedway as the traditional children's choir opens with "Oh, say can you see," and performs a stirring rendition of the National Anthem. Meanwhile, fireworks explode from all corners of The Last Great Colosseum on a beautiful August night prior to the green flag dropping at America's Night Race. Just before that, legendary country artist Lee Greenwood belts out God Bless the USA in his rugged sound as a powerful military flyover literally shakes the stadium. With tons of red, white and blue waving in the distance, the moment is guaranteed to produce a body full of goosebumps for every attendee. While the fans have assembled to cheer on their heroes on the track, like Larson, Elliott, Busch, Blaney, Truex and Harvick, legendary names like Earnhardt, Waltrip, Johnson, Petty, Wallace and Yarborough surround the stadium that has been host to NASCAR's elite level of stock car racing since 1961. The fans are also here to celebrate the true heroes, the first responders, military men and women and all others who serve to protect this great nation. That remains the true essence of the Bass Pro Shops NRA Night Race, Aug. 16-18. Bristol's partnership with Bass Pro Shops and the National Rifle Association remains a perfect fit for one of America's most cherished national pastimes. It honors hunters, sporting men and women, as well as American outdoor traditions. It’s a call to a large contingent of NASCAR fans who are dedicated to the lifestyle of fast cars and freedom. The electricity surrounding the Tri-Cities region tips to epic levels when August arrives. Members of NASCAR Nation, who annually represent all 50 states and more than 20 countries, gather at America’s Night Race to relax, celebrate the American spirit and enjoy some great racing. They sit around campfires and tell stories about legendary Bristol battles of long ago. They look up at the stars while drinking an ice cold Busch beer or opening up a fresh jar of Ole Smoky Moonshine and reflect on the great racing they are about to see during the weekend. Whether he or she is a welder, salesperson, farmer, accountant, soldier, firefighter or police officer, when they’re at Bristol everyone is proudly joined with a common title: race fan. When it comes to the race day experience, the Bass Pro Shops NRA Night Race never disappoints. As fans gather in the grandstands of The World’s Fastest Half-Mile, they will see a celebration of America’s pride, complete with salutes to the military and other American icons. Some of America’s favorite sporting heroes make their way onto the track for driver intros, complete with a ride-around in an American icon, an American-flag adorned Chevrolet Silverado truck. As drivers ride around, waving to one of the largest crowds in racing, you can feel the sense of patriotism in the air. When the command to start the engines is given, the noise is deafening. The sounds of 40 stock cars coming to life combines with the roar of a crowd that’s ready to see 500 laps of beating and banging action plus pure, unadulterated speed. There are other NASCAR races, but this place is special. It’s a half-mile of chaos and mayhem, and a place that has been likened to unleashing 40 fighter jets inside a gymnasium at the same time. As the sun goes down, the sparks begin to fly. Paint schemes shine under the bright lights and tempers begin to flare. From the legendary Dale Earnhardt Sr.-Terry Labonte battles of 1995 and 1999 to Tony Stewart’s legendary helmet throw after crashing while battling for the lead in 2012, Bristol is THE place where emotions run high. "The Night Race is the toughest race on the circuit, ever," said Darrell Waltrip, a three-time NASCAR Cup Series champion and 12-time Bristol winner, including seven victories at the Night Race. "It’s a long race, 500 laps and always close quarters. Someone is always breathing down your back. The level of intensity is like no place we go." There are four races scheduled during three nights of racing at the Bass Pro Shops NRA Night Race week, including action in the Bush’s Beans 150 Whelen Modified Tour event, UNOH 200 Camping World Truck Series race, Food City 300 Xfinity Series and culminating with America’s Night Racing on Saturday. During the Cup race, you’ll get to see all of your favorite drivers doing what they do best, including Bristol dominator and defending winner Kyle Busch, his arch-rival Kyle Larson, rising star Ryan Blaney, 2016 Night Race winner Kevin Harvick, Daytona 500 winner Austin Dillon, defending series champ Martin Truex Jr., Tennessee favorites Trevor Bayne and Bubba Wallace as well as the likes of Chase Elliott, Erik Jones, Brad Keselowski and Denny Hamlin. 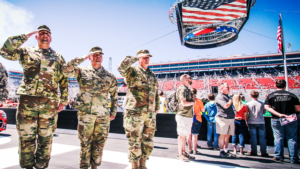 There's so much to do during the weekend around the grounds of Bristol Motor Speedway, including stops in the Fan Midway, Fan Zone and Kids Zone. There's music, games, food, souvenir haulers, driver appearances, autograph sessions and more. There’s great video entertainment provided by Colossus TV, the world's largest center-hung video screen. You'll also want to kick back and enjoy some NASCAR-style tailgating with your friends prior to each night's race. And speaking of fun, on Thursday, one of the biggest and longest running fan fests on the NASCAR circuit kicks off with Food City Family Race Night. There'll be plenty of appearances by drivers, legends and other celebrities during this event, which takes place in the BMS hospitality area and lasts from noon until 6 p.m.